The mountains offer no shortage of romantic spots to woo your beloved on Valentine’s Day. Here, we’ve narrowed the field to highlight five of the most amorous eateries around based on ambience, uniqueness, and quality of cuisine that are bound to earn his or her affection. There’s something dramatically romantic about dining in the grand former residence of renowned artist Elliott Daingerfield. The Greek Revival mansion, which now houses Westglow Resort & Spa, is an enchanting place to sip a glass of wine and watch the telltale “glow” as the sun sets behind the mountains. Join a handful of guests in the elegant dining room, where Daingerfield’s paintings adorn the walls. The bonus is you can stay overnight and indulge in a trip to the spa and meditation room. Prepare to be transported to an exotic world. In a private nook, take a seat amid plush velvet pillows and listen to the rhythms of live music, sometimes accompanied by a belly dancer. The dim, candle-lit interior is rich with color and so is the cuisine. The menu entices with flavorful tapas plates, one more alluring than the next, and an extensive selection of Spanish wines. Perched on Beech Mountain, Jackalope’s View at Archers Inn feels like a tavern at a rustic ski lodge, far removed from the rest of civilization. As dusk approaches, picture windows offer 180-degree views of the opposite ridge. After a meal of oysters, roasted duckling, or game, retire to The Presidential room where a fireplace and decanter of port awaits. This eatery has long been favored for excellent cuisine and fireside dining. 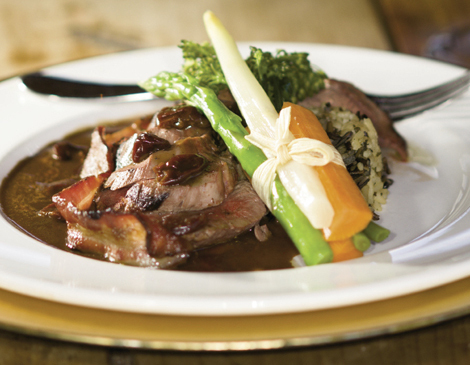 Chef Wolfgang Green earned his chops at Commander’s Palace in New Orleans, so rich Lowcountry specialties such as lobster bisque and crawfish étouffée share the menu with grilled venison tenderloin and other decadent dishes.